Karachi (Agenzia Fides) - "I have worked alongside Archbishop Coutts for the last 11 years. The choice to appoint him Cardinal is a great honor for the entire nation of Pakistan. We support him in building and promoting love, peace and harmony and unity in Pakistan. We will soon organize a large interreligious gathering dedicated to His Eminence Joseph Cardinal Coutts": says to Agenzia Fides Allama Mohammad Ahsan Siddiqui, director of the Interreligious Commission Peace and Harmony in Karachi. Several civilian and religious leaders positively commented the appointment of Joseph Coutts as Cardinal. Fr. Saleh Diego, Vicar General of the Archdiocese of Karachi, said: "We are happy: the Archbishop is known for his tireless work in promoting harmony and dialogue in the country". 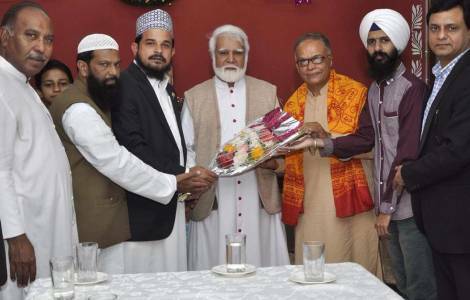 Ravi Dass Vaghela, Hindu leader and media coordinator in Shri Ram Devji Mandir in Karachi, member of the organization "Masterpeace Pakistan" speaking to Agenzia Fides says that "Pope Francis has chosen the perfect man from Pakistan: a man with his feet on the ground, admirable for his simplicity and humility. This decision will strengthen harmony in Pakistan", he said, expressing his congratulations on behalf of Hindus in Pakistan. The president of the Pakistani People's Party Bilawal Bhutto Zardari has written "we cannot wait to work together with Cardinal Coutts in a peaceful and tolerant Pakistan", while also Syed Murad Ali Shah, Prime Minister of the Province of Sindh led a delegation and visited St. Patrick's Cathedral to meet Archbishop Coutts. Also Hafiz Naeem-ur-Rehman, leader of "Jammat-e-Islami" Karachi wanted to meet Archbishop Coutts, confirming the common commitment to "spread love and peace", and asked Cardinal Coutts to work for peace in Kashmir, India and Palestine. ASIA/PAKISTAN - Cardinal Coutts: "A call to pray and serve my people and the universal Church"
ASIA/PAKISTAN - Cardinal Coutts: "Dialogue of life and service towards the suffering humanity to break the walls of hatred and intolerance"